Click on Esterita Austin link at top left of this page. The Quilt Artists of Kentucky was formed in 2003 as an auxiliary of the Kentucky Heritage Quilt Society. Membership in QAK is limited to current or new members of the Kentucky Heritage Quilt Society. Membership dues to join the Quilt Artists of Kentucky are $5 per year in addition to KHQS membership dues. The group’s purpose is to serve as a support and information group for those interested in innovative quilt-making techniques and the quilt as an art form; to provide exhibition opportunities; and to provide education to the general public about the art of the quilt. The QAK Annual Meeting will take place during the KHQS Getaway, on Wednesday June12, 2019 at 4:15pm. The meeting is open to everyone interested in QAK. The quilts made in answer to the 2019 Quilt Challenge "MANDALAS EXPLODED", will be on display. There is still time to make a quilt. The details for the challenge can be found by clicking on the QAK Drop Down Menu Button. This challenge is open to non-QAK members for a $30.00 fee. QAK members do not pay a fee. A new challenge was also introduced at last year's Annual Meeting. It's the "WHAT IF" SMALL QUILT KIT CHALLENGE. Details and how to order a kit can be found under the WHAT IF button, on the QAK Drop Down menu button. This challenge is only open to QAK members. The "WHAT IF" finished pieces will also be on display at the Annual Meeting and the QAK Table at Getaway 2019. The new Quilt Challenge will be announced. New "What If" kits will be available for purchase at $10.00 each. Anyone who joins KHQS can join QAK for $5.00 per year. Do you love Quilt Shows? What about coming up with a Challenge Quilt Theme? Would you enjoy arranging for exhibit space for the QAK Challenge quilts? How about getting to deliver the quilts to show venues and get to be a docent at those shows? Then I have an offer for you! QAK needs a new Show Chair. If you are interested, then let me know. I will still be the QAK Chair and provide help but I cannot be Show Chair after this summer. Thanks for stepping up for QAK! 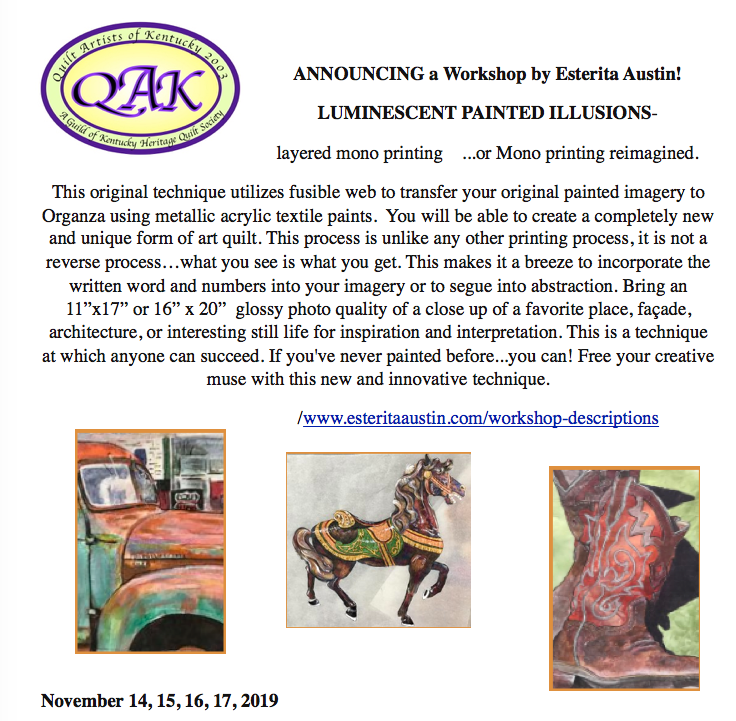 Click on the Esterita Austin link in the upper left corner of this page for more information about the workshop and how to register.